March Hiking: What's Magnetite Got To Do With It? Here we are, the end of March already, and there’s a lot going on in the world of hiking. This March 2019 issue of Happy Trails takes you right to it. If you’re planning a multi day or extended backpacking trip, this app has some updated features you might need, including expanded coverage of the glories of Canadian hiking destinations. Please share this information with anyone looking to plan a hike in celebration of National Trails Day on June 1, 2019. Go big (organize a large community trail event) or small (invite some friends for a hike or other outdoor activity). Know anyone who is fascinated by moose & wolf behavior? Maybe you are! We all know the truth of this statement, to whatever degree it applies to self or trail buddies. A recent video I discovered is a realistic (and emotional) portrayal of what happens when a traumatized veteran turns to long distance hiking as a self healing modality. It’s presented by REI, with a cautionary note at the beginning of the video: avoid viewing these 14 minutes if you may be triggered by this sensitive subject. I’d love to hear your thoughts on it, just hit reply. My heartfelt wish is that something on this HFH review list will help you or inspire more trail time. I strive each month to find the best stuff to enhance your outdoor enjoyment. Last month you had a chance to meet Irish. This month, meet Paula! These women share why they have added this private hiking community to their list of trail tricks. News flash: we just celebrated our first anniversary as a hiking group! We're excited! Enter for your chance to win a pair from Viakix in the March giveaway. By the way, every month there are flash giveaways for the readers of the Hiking For Her weekly updates. What could you win? A book, something featured in one of the HFH reviews, a free membership in the hiking community, who knows?? You can sign up for the free update using the link at the end of this newsletter, and cancel at any time with one click. REI REBATE AND COUPONS: WOOHOO! Now is the time of year to swoop in and select the best deals for your upcoming outdoor plans and hiking trips. In addition to applying your annual rebate (10% of your qualified purchases in 2018), you can layer some coupon magic on your final price to watch the number go as low as possible. Take 20% off one full price item (create your own sale, right?) through April 8, 2019. Shave 20% off one outlet item to make an already good deal a fantastic savings event, good through April 8, 2019. Save $500 on a Montenegro hiking adventure, or how about knocking off $150 on a 2019 Pacific Crest Trail backpacking trip with REI? Book by April 8th! Score 10% back on a bonus card when you spend $50+ on REI Co-op brand items, through March 28, 2019. I’ve hiked with people who get turned around when they bend down to tie a boot lace, and that’s no exaggeration (no names, Sheryl). I’ve also hiked with folks who could find their way back to the trailhead through fog thicker than the hairs on a mountain goat’s back. Me? I’m somewhere in between. But now I know why: magnetite. Some of us have more of this stuff in our heads than others! Which explains why a reliable -vs- iffy sense of direction as a hiker is normal. As usual, I’m way over a self imposed word limit, and you know what? I’m not going to fret over it. Think of it as a section hike through the Lovely Land Of Hiking, rather than a dayhike (which is the weekly update). Please drop me an email to say hi, to ask what’s up with the War and Peace length newsletter (!! ), or to suggest something new to write about. I’m up for all of it! Wishing you good health and good humor as we head into high season for Northern hemisphere hikers, or fall/winter hikes and snowshoeing for the Southerners. P.S. I’m not big on blowing the Hiking For Her horn (or is that a rescue whistle? 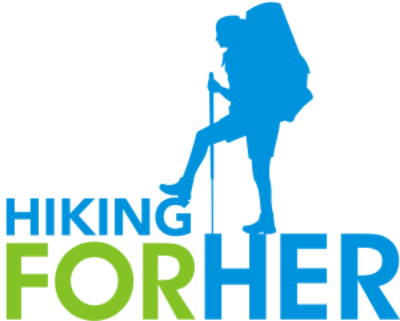 ), but was asked to mention that HFH earned the number 3 spot on a recent list of Feedspot’s Top Women Hiker blogs for 2019. It's an honor to be among these wonderful women! But it seems that my social media presence could use a little love, so please do that Facebook liking thing if you’re so inclined (link below). Together, stronger and smarter female hikers, right? You create a small miracle when you buy hiking gear through those links, by allowing a modest percentage of your purchase price to flow into the HFH coffers. You receive great gear that has been trail tested and approved by a seasoned hiker. You pay nothing extra. AND you help keep the free hiking tips flowing to your virtual trail buddies around the globe.